Christo's Walking on Water — WorksOnWater Works On Water Blog Blog focused on artists who examine, move over, look at, work with, journey on, use metaphorically, or create new connections to water, rivers, lakes, oceans, or boats. While Christo’s work is more conceptual than place-based, it is by necessity site-specific. His latest work “The Floating Piers” allows visitors to Lake Iseo, Italy to walk on water. A recent documentary allows you a view into the sometimes harrowing process of the 22 month build. Ten years after the passing of his wife and creative partner, Jeanne-Claude, Christo sets out to realize The Floating Piers, a project they conceived together many years before. 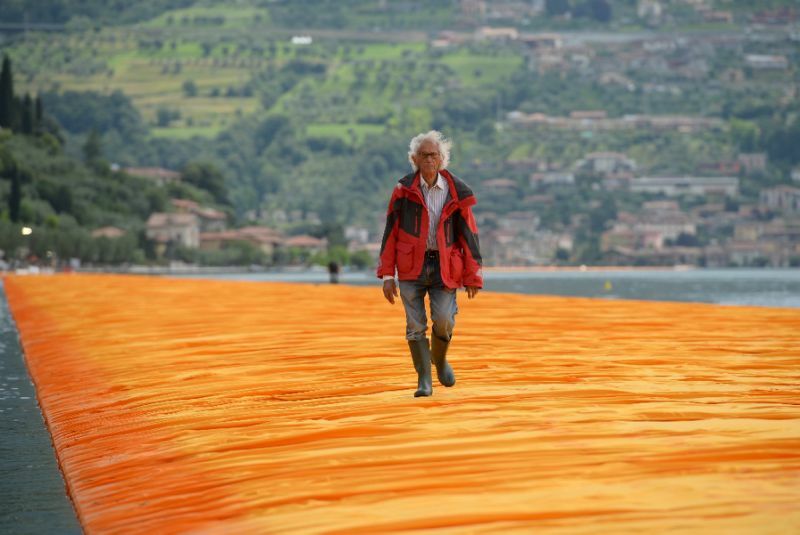 Boasting uncensored access to the artist and his team, Walking on Water is an unprecedented look at Christo’s process, from the inception through to the completion of his latest large-scale art installation, a dahlia-yellow walkway atop Italy’s Lake Iseo that was eventually experienced by over 1.2 million people. The film takes the viewer on an intimate journey into Christo’s world amid mounting madness – from complex dealings between art and state politics to engineering challenges, logistical nightmares, and the sheer force of mother nature. Captured through breathtaking aerial views and fly on the wall camerawork, we watch the artist’s vision unfold, and get to know the man chasing it.